The new MapNode class represents nodes that can render geographical maps. At this time map nodes can display the content of an Esri shapefile files. The content of a map file is represented by an instance of the MapContent class that should be assigned to the Content property of a MapNode. 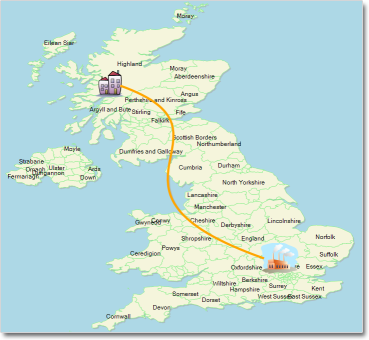 When the map is associated with a DBF database file, map regions can display labels – further details here. The SvgImporter class allows importing Scalable Vector Graphics files (*.svg) into MindFusion.Diagramming. Each top-level SVG group element is imported as a separate SvgNode, whose Content is set to the group’s child elements. when they would not fit newly added nodes. Now the NodeModified event is raised after the undo record for that modification has been added to the command history. This makes it easier to merge the ModifyItemCmd with custom commands created from NodeModified handler. and more – read the full list here. The new VisioImporter lets you import Visio 2003 XML Drawing files (*.vdx) into WpfDiagram. You can import all standard Visio flowchart shapes as well most of the UML and Database entity shapes. The shapes are imported to their closest representations in the MindFusion.Diagramming for Wpf object model. 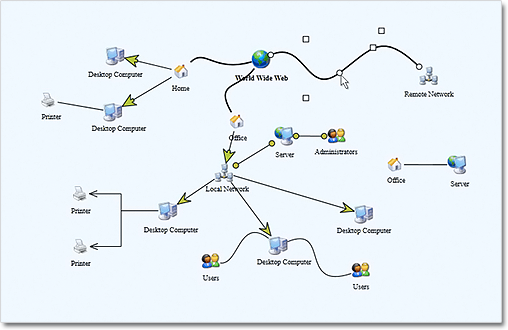 The relationships between the objects are preserved and the Visio links are imported as DiagramLink objects. Additionally, most of the attributes of the Visio objects such as text, text format, fill and line colour and style are preserved. WpfDiagram raises an event for each imported node and you can set the shape node if it is not recognized by the control or you want to change the shape. The Import method imports all Visio pages into a DiagramDocument. A DiagramPage is created for each page from the VDX file. The new GetPageCount and ImportPage methods let you determine how many pages are in the Visio document and import only a single one. 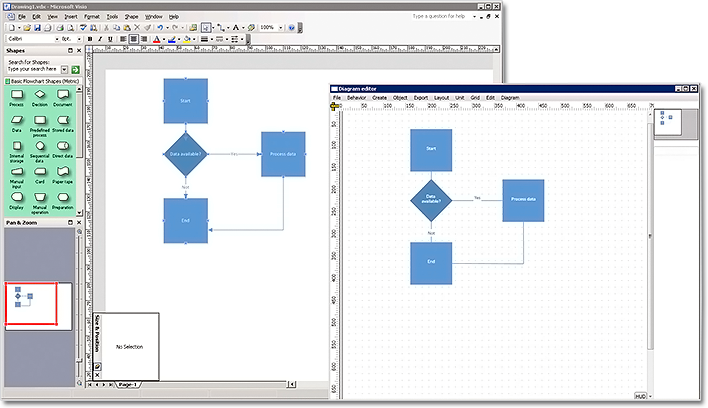 You can import all Visio pages into a single diagram. It is easy to import a diagram from Visio. The overload methods of AttachTo that attach node to link segments or control points, now let you specify negative index values. Negative values are interpreted as relative to the last point or segment, regardless of the current number of link segments. The handling of Clip paths in PdfExporter is improved. You can export the swimplane grid to Visio by setting the ExportLanes property of the VisioExporter. 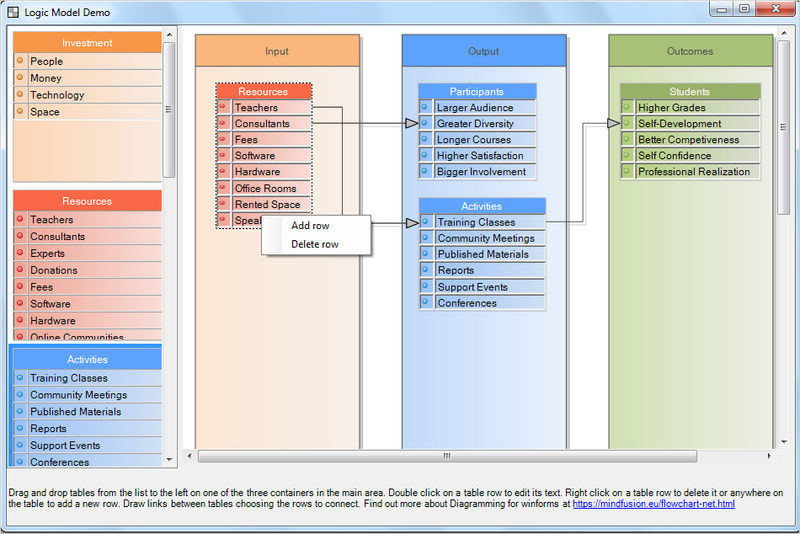 The Copy method lets you copy text attributes between objects that implement the ITextAttribute interface, such as diagram items table cells, tree items. as well other new features – check the full list here. An arrow is shaped by its control points. 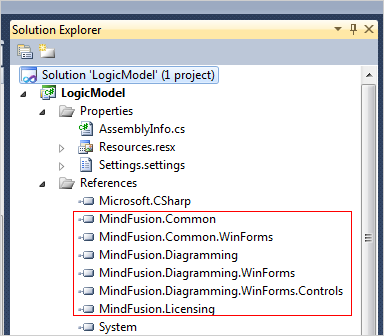 If you face difficulties installing or using Diagramming for Wpf, please contact MindFusion support team per e-mail or phone. You can also use the forum or help desk. All support inquiries are answered within hours of receiving them. The control boasts a long list of events, properties and methods for user interaction, item creation, data input and output. You can read the full features list here. The online demo shows samples that demonstrate various capabilities of the control. The licensing scheme and prices are uploaded at the buy page. Source code is also available.